The Church of Scientology opened its new National Affairs Office in Washington, D.C., September 12, 2012, in ceremonies attended by more than a thousand officials, dignitaries and Church members. 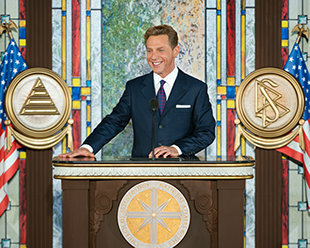 Mr. David Miscavige, Chairman of the Board Religious Technology Center and ecclesiastical leader of the Scientology religion led the dedication. Dignitaries joining in the opening ceremony included Members of U.S. Congress Rep. Dan Burton (R-IN), Sheila Jackson Lee (D-TX) and Danny Davis (D-IL); as well as Ms. Liz Gibson, Senior Program Manager, Federal Emergency Management Agency. The Church of Scientology celebrated the grand opening of their National Affairs Office in Washington, D.C., on Wednesday, September 12. More than a thousand Scientologists, guests and dignitaries convened for the dedication of the Office, which permanently extends the full array of Church-sponsored humanitarian programs and initiatives to the national and international communities of the U.S. capital. 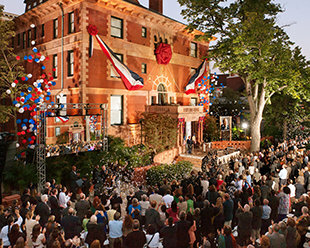 On Wednesday, September 12, 2012, dignitaries and Scientologists celebrated the grand opening of the Church of Scientology National Affairs Office in the landmark Fraser Mansion at Dupont Circle. The building, dating from 1890, is a nationally registered historic landmark. Under the Church’s custodianship, the combination Beaux-Arts, Renaissance and Romanesque structure has been meticulously restored and preserved. The Church of Scientology National Affairs Office, located in the historic Fraser Mansion at Dupont Circle, extends the array of Church-sponsored social betterment programs and humanitarian initiatives to the spectrum of institutions, organizations and agencies in Washington. Housed in the historic Fraser Mansion at Dupont Circle in Washington, D.C., the Church of Scientology National Affairs Office welcomes federal and state officials as well as representatives of Washington’s diplomatic missions, nongovernmental organizations, policy institutes and charitable foundations. Visitors to the Church of Scientology National Affairs Office are welcome weekdays, evenings and weekends, to attend scheduled conferences and events or for further information or a tour. Among the many architectural elements the Church meticulously restored in Fraser Mansion is the reception’s ornate white marble fireplace with attached settees and intricately carved floral motif mantel and frieze. In Chestnut Hall, the National Affairs Office staff hosts seminars, roundtables, symposia and conferences of government and community groups collaborating to address social and humanitarian issues. Chestnut Hall is further configured for performances and receptions marking important occasions. The hall’s fireplace mantel and overmantel are carved of prize American chestnut trees, extinct since the early 20th century. Fraser Parlor provides an ideal setting for informal gatherings of guests to the Church’s National Affairs Office. The room’s original architectural features have been preserved, from the inlaid ceiling panels of hand-tooled Moroccan leather to the green marble fireplace framed with a hand-carved walnut mantel. The Pennsylvania Room is configured for working meetings of the Church of Scientology National Affairs Office staff and other religious and humanitarian organizations. It originally served as the mansion’s formal dining room, its large south-facing oriel window providing a view toward the White House and the Washington Monument. The Fraser Mansion Pennsylvania Room includes an historic fireplace of hand-carved yellow marble, supported by fluted Ionic columns and crowned by an ornate floral motif overmantel. It is one of the 14 fully restored fireplaces in the landmark home, each featuring a distinct variety of marble or granite with a unique and ornate mantel of wood or stone. The Dupont Room is designed to serve as a venue for events ranging from informal luncheons to formal banquets, for civic committees, interfaith councils, national volunteerism bodies and international human rights coalitions. The Information Center provides an introduction to the social betterment programs and humanitarian initiatives supported by the Church of Scientology and made available to Washington through the National Affairs Office. The entrance to Fraser Mansion, with its wide oak paneling and decorative brass handrails, stands in tribute to the building’s Victorian heritage. The Fraser Mansion entrance foyer’s paneled oak doors and leaded glass windows are restored to their original late-nineteenth-century splendor. Among the most notable features of the Fraser Mansion is this grand staircase, with its rare, fine-grained oak and mahogany, and intricately carved balustrades fully restored by the Church. The arched double doors off the second-floor foyer lead to a terrace built atop the front portico, offering views of Dupont Circle and the surrounding “Old City” of Washington. The Church of Scientology’s National Affairs Office is located off Dupont Circle in Fraser Mansion, a registered national historic landmark. The 24,000-square-foot building, constructed in 1890 as the home of New York stockbroker and merchant George Fraser, is the creation of noted D.C. architects Hornblower and Marshall. Under the Church’s custodianship, the eclectic Beaux-Arts, Renaissance and Romanesque building is meticulously restored to its original grandeur. On Wednesday, September 12, national dignitaries joined more than a thousand Scientologists and guests to celebrate the grand opening of the Church of Scientology’s National Affairs Office in Washington, D.C.
Underscoring the role served by the new National Affairs Office in the Church’s greater social and humanitarian mission, Mr. David Miscavige, Chairman of the Board Religious Technology Center and ecclesiastical leader of the Scientology religion, dedicated the new facility. Located in the historic Fraser Mansion at Dupont Circle, the new National Affairs Office stands as the central point from which the Church coordinates its many social and humanitarian initiatives on a national and international level. The establishment of the National Affairs Office is necessitated by the Church of Scientology’s unprecedented worldwide growth and commensurate demand for Church-sponsored programs. In the past several years, dozens of new Ideal Churches of Scientology (Ideal Orgs) have opened in major cities across the world. In the United States, new Churches now stand in Washington, D.C., New York, San Francisco, Los Angeles, Sacramento, Seattle, Denver and Phoenix, to name but a few. While internationally, they also now stand in Rome, London, Madrid, Brussels, Berlin, Hamburg, Mexico City, Johannesburg, Melbourne, Moscow and Tel Aviv. Ideal Orgs are designed to both serve the needs of parishioners as well as the community at large, while the National Affairs Office serves to facilitate implementation of the Church-sponsored programs both nationally and internationally. These programs include a worldwide human rights initiative; equally far-ranging drug education, prevention and rehabilitation programs; a wide-reaching criminal reform program; a global network of literacy and learning centers; a moral education movement restoring the brotherhood of Man; and the Scientology Volunteer Ministers, the world’s largest independent relief force providing emergency response at major disaster sites for more than a decade. Dignitaries joining in the opening ceremony included Members of U.S. Congress Rep. Dan Burton (R-IN), Sheila Jackson Lee (D-TX) and Danny Davis (D-IL); as well as Liz Gibson, Senior Program Manager, Federal Emergency Management Agency. The Church of Scientology National Affairs Office houses an array of facilities for meetings, conferences, seminars, workshops and events to promote collaboration on solutions to society’s greatest challenges. In particular, its Chestnut Hall is configured to host a wide range of functions, from human rights symposiums and drug education workshops to panel discussions, press conferences and awards ceremonies. The Church of Scientology acquired Fraser Mansion in 1994 to serve as home to the Church of Scientology of Washington, D.C., now located in expanded quarters on 16th Street Northwest’s historic Church Row. The mansion, dating from 1890, is a nationally registered historic landmark. Under the Church’s custodianship, the combination Beaux-Arts, Renaissance and Romanesque building has been meticulously restored to its original glory. Fraser Mansion also stands just two blocks from the historic Founding Church of Scientology at 1812 19th Street NW, established in 1955 by Founder L. Ron Hubbard. The dedication of the Church of Scientology National Affairs Office follows the opening of a series of Ideal Churches of Scientology (Ideal Orgs) in 2012, including the new Center of Scientology in Tel Aviv-Jaffa, August 21; the Churches of Scientology of Los Gatos, California, July 28; Buffalo, New York, June 30; Phoenix, Arizona, June 23; Denver, Colorado, June 16; Stevens Creek in San Jose, California, June 9; Orange County, California, June 2; Greater Cincinnati, February 25; Sacramento, California, January 28; and Hamburg, Germany, January 21. In total, the Scientology religion today comprises more than 10,000 Churches, Missions and affiliated groups, with millions of members in 167 nations.